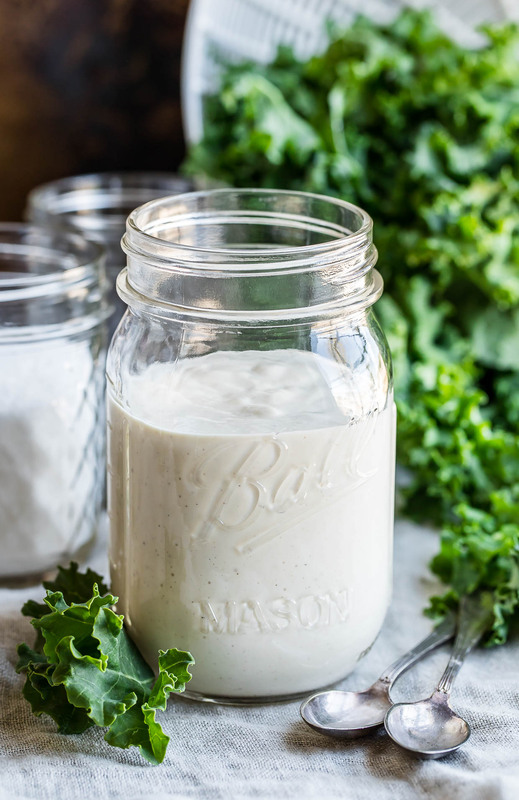 This homemade Caesar dressing is hands-down our favorite! It’s thick, creamy, and full of flavor, perfect for a rockin’ Caesar salad. So my 4 year old is officially obsessed with ghost stories. I don’t want ghosts watching me sleep and I certainly don’t want MSG in my dang salad dressing. This totally goes without saying, but homemade salad dressing is where it’s at! Not only will you know each and every ingredient in your jar-o-dressing but you’ll also have a custom flavor that you totally adore. 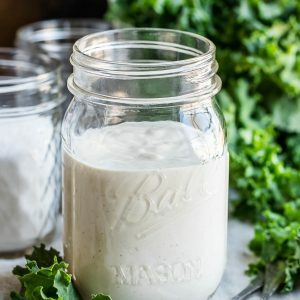 Gone are the days of buying 4 different brands of salad dressings only to realize that none of them taste even half as good as you had hoped they would. Love your dressing crazy thick, thin + pourable, extra creamy or with an added burst of citrus + acidity? Whisking together your own delish dressing will guarantee you get the texture and flavor your craving! 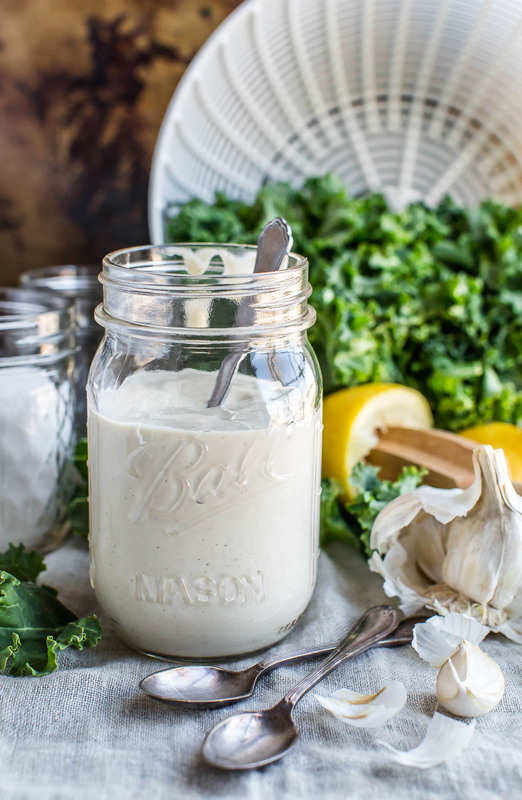 For this creamy Caesar dressing, anchovies are a must! If you pick up an itty bitty tin, you’ll have enough to make 2-3 jars of dressing. Make a jar now, then store the rest in your fridge for the next time you make the dressing! Discard the tin and store in a clean container along with the oil it’s packed in to keep it fresh. According to BBC good food, you can also freeze anchovies by laying them out individually on a parchment paper lined tray and open freeze them. Once frozen, transfer to a freezer bag and return to the freezer until needed. Easy peasy! While many traditional Caesar dressings rely on a raw, pasteurized egg for a little extra oomph, I’m not one to go out and buy an entire carton of pasteurized eggs just to make a dang dressing. As written, the dressing is my idea of flavorful, delicious, and totally-craveworthy! 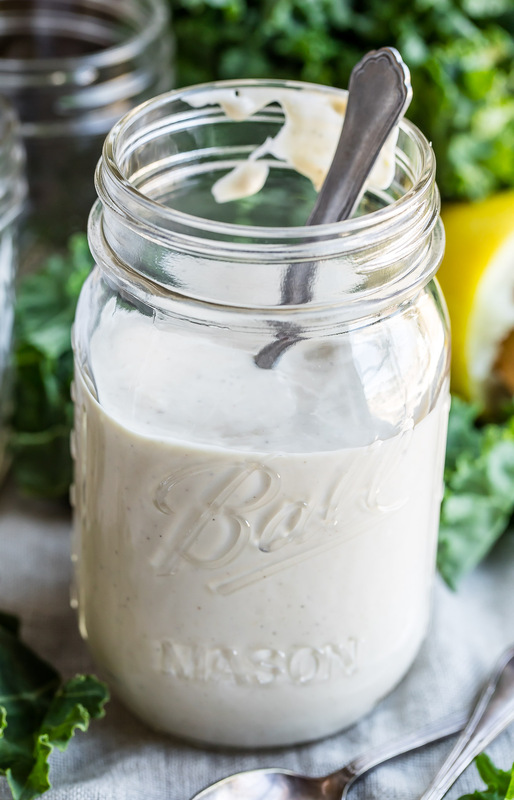 This homemade Caesar dressing is hands-down our favorite! It's thick, creamy, and full of flavor, perfect for a rockin' Caesar salad with all the fixin's. Recipe yields approx. 18 (2 TBSP) servings or about 1 + 1/4 cups of dressing. It's also crazy easy to double or triple to serve a large group. Enjoy! For a perfectly blended dressing, I highly suggest using an immersion blender or food processor. You'll simply combine all your dressing ingredients and blend well. To thin the dressing, add extra lemon juice as desired. You can also make the dressing with simply a bowl and a whisk by mashing then mincing your garlic and using anchovy paste in place of whole tinned anchovies. Easy peasy! You are totally welcome to add extra of your favorite ingredients. I suggest starting with the above recipe and tasting it with a few lettuce leaves, then adding a little of any particular ingredient you choose. Some opt for extra garlic, some prefer more anchovies or Worcestershire sauce, and some people (like myself) love extra lemon juice. Recipe via Once Upon a Chef + Gourmet Magazine. * For this recipe I used 2 tinned anchovies and froze the remainder for the next batch of dressing I plan on making. We make this one a lot! You can also use anchovy paste if you keep that on hand (or score some at the store) and you'll simply use 1 tsp of paste. If you skip the anchovies altogether it won't have that traditional caesar flavor and will be more of a creamy parmesan dressing. ** Freshly grated, off the block/wedge, Pamigiano-Reggiano cheese is key here! A good quality parm will add more flavor to this delish dressing. Nutrition Facts below are an estimate gathered using an online recipe nutrition calculator. Values based on each 2 TBSP serving. Adjust as needed and enjoy! We love Caesar dressing in our house and, you are so right, that you can’t find a really decent tasting one in the store. And OMG, all the ingredients that go into that bottle! I’m with you on that! I love that this dressing is so easy and similar to one that I make. I use an anchovy paste and have some in the fridge. Will that work? Love this fresh dressing. Totally worth hunting down and using anchovies! Caesar Salad is a staple food in our house…this will be SO great to have on hand! A Caesar is my hubby’s favorite salad and I’m so happy for this egg free recipe for the dressing!! Delish! Our family is all about salads…I love the idea of a homemade dressing like this. Can’t wait to try it! I totally approve of your caesar dressing as this is exactly the way I make it! It’s just so good! I am about to make another jar right now! 🙂 Thanks Amber!